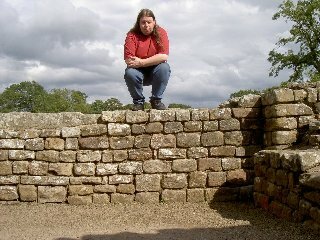 Today at work while pondering a problem I propped up my head, forehead in the palm of my hand. I was distracted so it took me a few minutes to notice. My face felt different!?! I'm positive mine was fuller and more firm just yesterday. Of course I knew it was mine but it didn't feel right. It was a delicate area lacking the familiar fleshiness. It was the forehead of an older woman. Dear God! First the knuckles and now this? The swollen "Hey these are my mother's hands" joints visited me a few weeks before my birthday and decided to stay on a while. I know it happens to everyone. Those "I'm becoming my (mother, father, aunt, uncle, etc...)" moments hit you when you're already vulnerable. All those things you took for granted as just the way (Mom, Dad, etc...) was will sneak up on you. I used to tease my Mom about her speech. Little catch-phrases that sweet little southern woman used all the time used to amuse me. I'd point them out to her and tease her about them. Now, I find them sneaking into my conversations. I can honestly say I never remember saying T-total until after she died. I like to tease my relatives and tell them she's haunting me. First the cute but silly catch-phrases, then the knuckles and now the dreaded facial changes, each day I'm a little more like my mother. If you listen closely you can hear her giggling. Oh and if you've yet to begin your transformation, never fear, your day will come. What will I do about all this? I suppose the only course of action is complaining and whining. Until those fine folks in the vitamin companies start churning out You're Nothing Like Your (Mother, Father, etc...) pills it's every terrified inner child for itself. As for now, barring a return to age-appropriate body parts, I'm going to grow some bangs and hope gloves come back in fashion. The last person who lived here must have got around a bit. I used to get about 1 telemarketing call every month. Now I get a call about once a day. Occasionly, I'd get a recorded phone call, telling me I've won some lottery in some far off place. This was amazing news as I hadn't even bought a ticket! All I need to do is call a premium rate line and probably hand over a processing fee. I called the BT operator service, informing them. I was passed onto the TPS - a service where I can opt-out of telemarketer calls. Call me naive, but these people are already breaking fraud laws, I doubt breaking a lesser law is going to be much of a deterant. I'd have called the operator back, but Stargate Atlantis was about to start. By the way, have you met Thia? The next post below came from my close friend, Thia. We've decided to do a joint effort, rather than have separate diaries. We'd only keep refering to each other's anyway. Congratulate me. I put up my Christmas tree last night. It's not just any old tree. No. 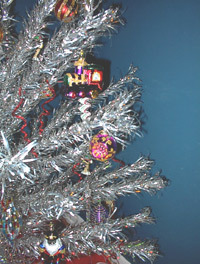 It's a 1960's aluminum Christmas tree. Woohoo! I haven't had one of these since I was a child. It's been a dream of mine for years to find one and start this shiny, cheesy tradition in my adult life. It's official, I'm in my second childhood. And, I have my best friend K to thank for finding this treasure for me. It's a dream come true. God help me, I need a real life. New domain, new diary. Let's see how long this one lasts.